Falaki Theater, AUC Tahrir Square. “Anomalies” are exceptions or points of deviance. This is an art photography exhibition of selected works by over forty alumni and students who completed the "Introduction to Digital Photography" course at the Visual Arts program between Fall 2013 and Spring 2018. Students taking this course come from various academic backgrounds and are novice photographers who work on creating photographic bodies of work, or series. The images chosen to be part of this exhibition stand-alone, separated from the complete series. This is a chance to explore and acknowledge these exceptional works. 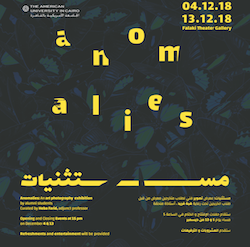 Anomalies is curated by Heba Farid, adjunct professor, Visual Arts program. The opening of the exhibition is on the December 4, 2018 at 5 pm. Gallery hours: 10 am to 10 pm daily until December 13.